Corinne Lepage is a lawyer, Doctor of Law, and a pioneer in environmental law with major lawsuits like Amoco Cadiz or Erika, conducted with M. Christian Huglo. She taught public law and environmental law for 30 years at the Institute of Political Studies in Paris. As a politician, she held a local mandate for 12 years and then served as the Minister of the Environment from 1995 to 1997 in France. 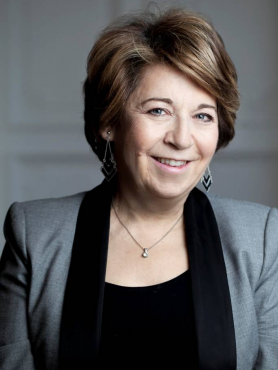 She was elected as a Member of the European Parliament between 2009 and 2014, and served as the first vice-chair of the European Parliament’s Environment and Health Committee. Very invested in various associations, she has been a member of the Executive Board of International Transparency for 15 years. She now chairs the Movement of the Entrepreneurs of the new economy, the 2 ° investing association specialized in climate risk assessment and the international association WECF. At the time of the COP21, she was charged by the President of the French Republic of a mission in favor of a Universal Declaration of the Rights of Humankind. She still presides the association of the friends of the Universal Declaration of Humankind’ Rights signed by many public authorities, companies, NGOs, universities, and Lawyer’s Bar Associations around the world. She is also the author of some thirty books about environment and governance.